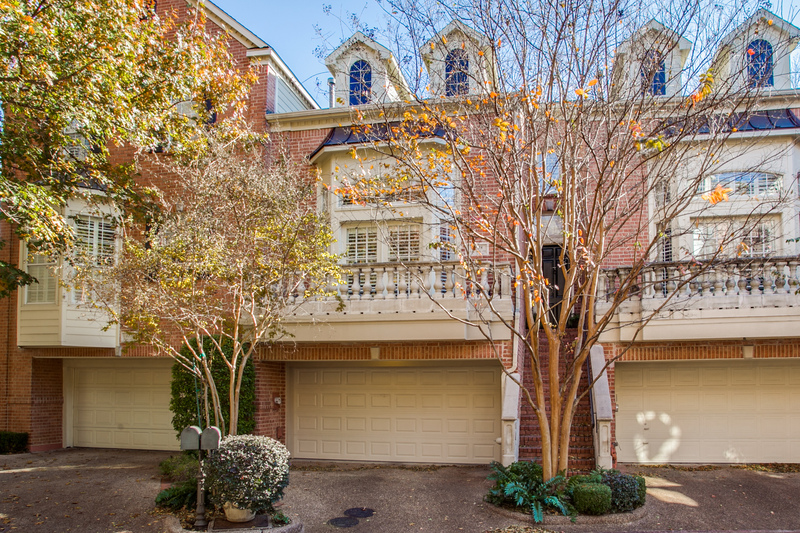 Situated in prestigious Highland Park in the fabulous gated community of the Townes of Highland Park, this beautiful traditional three-level townhome is nestled in a highly sought after location in the award-winning Highland Park School District near Whole Foods and nearby shopping areas. Only one of 24 private residences, details include soaring 10-foot ceilings, expansive entertaining rooms, handsome hardwood floors, deep crown molding and millwork, plantation shutters and beautiful marble finishes throughout. Exuding warm elegance and sophisticated interiors, the wonderful home is graciously appointed with approximately 2,052 square feet, two luxurious ensuite bedrooms, 2.1 baths, a gorgeous 21-foot vaulted living room showcasing a marble-surrounded fireplace, built-in bookcases, a private balcony and also opens through columns to an elegant 10-foot dining room, a spacious light-filled island kitchen with white appliances, a butler’s pantry, breakfast bar and a large morning room with a bay window, a luxurious third level master suite with a pop-up ceiling with a bay window, built-ins bookcases with storage, a huge walk-in closet and a see-through marble-surrounded fireplace into a fabulous marble bath with His and Hers vanities an a vanity desk area, a jetted tub, separate shower and a toilet room, first floor spacious den opening to an inviting private patio, generous-sized bedroom with neutral carpeting, a large walk-in closet and an elegant full ceramic tiled bath, fully equipped utility room, elegant powder room with stylish wall coverings, and an oversized two-car attached garage completes this fabulous residence.